This article in the East Anglian Daily Times is entitled Multi-Million Pound Lift Could Boost Rail Link From Sudbury To Colchester. Greater Anglia intend to improve the service on the Gainsborough Line by running direct services between Sudbury and Colchester Town stations. One of the reasons for doing this, is that the increasing number of passengers travelling between Sudbury and Colchester will avoid changing trains at Marks Tey station. This Google Map shows Marks Tey station. The two platforms on the Great Eastern Main Line. The single platform for the Gainsborough Line. The footbridge over the main line. As can be seen, the only step-free interchange with the Gainsborough Line is to and from trains going North to Colchester and Ipswich. These pictures show the frootbridge and the Gainsborough Line platform. It is not an ideal interchange for passengers other than the unencumbered, fit and healthy. I suspect some passengers from Sudbury to London might even take a train to Colchester first and then use the lifts to change to a London train. And then there’s the Car Parking! Note in the Google Map, that the station has two car parks, one on each side of the line. So most using the car parks will have to cross the line on the footbridge. 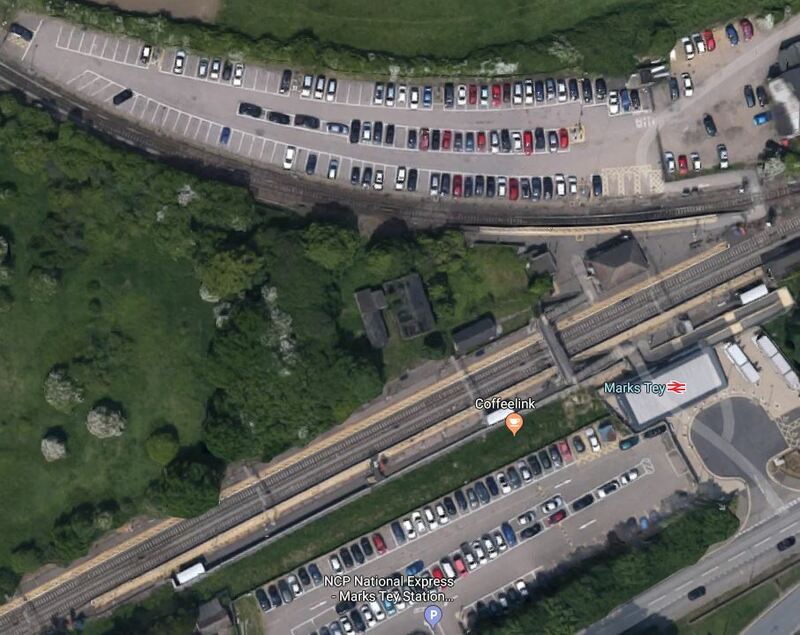 Also note, that the car park on the Northern side of the station, is connected to the station using a pedestrian crossing over the single track rail line, that connects the Gainsborough Line to the Great Eastern Main Line. According to the East Anglian article, this rail line is used twice a day. But when the Sudbury to Colchester Town service starts, it will be used twice an hour. Anf if this service is successful, I can see Greater Anglia wanting to run the service with a frequency of two trains per hour (tph), which would mean four tph going over the pedestrian crossing. Understandably, Network Rail want to remove the pedestrian crossing. This is a paragraph from the East Anglian article. The national fund has £300m available – and Mr Burles said he estimated that the cost of the work at Marks Tey would be between £4m and £5m. It is at the top of Greater Anglia’s “wish list,” but political support would be necessary if the money was to be released. As to the political support, the Gainsborough Line and Marks Tey are in a total of five constituencies; all of which are Conservative. I suspect, Chris Grayling could be under severe pressure from this one. Although you have to remember that to many civil servants in the Department of Transport, Suffolk is just an area, you pass through on the way to your weekend cottage in Norfolk.